AQ Audio SmartSpeaker gets lower price and new colours | What Hi-Fi? 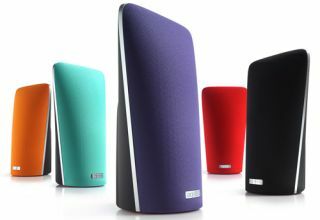 AQ Audio has expanded its SmartSpeaker wireless speaker with the addition of a new, cheaper model – the £129 A2 – available in a range of new colours. Unlike the original A1 model which has a built-in rechargeable battery, the A2 is mains-powered only. One-touch AirPlay set-up lets you stream music from iTunes, internet radio, Spotify and audio from films and TV programmes. Two A2s can be set up as a stereo pair (when streaming via iTunes on a PC or laptop), and if you already own a SmartSpeaker A1 it will be fully compatible with the A2. Android users are also catered for: the free AQ Audio Android App available in the Google Play store will stream audio from any Android device to the A2. AQ Audio has teamed up with AirFoil, the popular software that enables you to send audio on your Mac or PC to one or multiple AQ SmartSpeakers, offering a 40% discount on the software when you buy any SmartSpeaker. The A2 is available with interchangeable covers in the following colours: emerald green, poppy red, african violet and orange zest. A single SmartSpeaker A2 costs £129, a twin pack £235 and four pack £454.